Cotton Gin - invented by Eli Whitney. Reaper - invented by Cyrus McCormick. Winnowing Barn - invented in South Carolina. Nitrogen Cycle Crop Rotation - invented by George Washington Carver. Telegraph - invented by Samuel Morse. Oil Pipeline - invented by John D. Rockefeller. Oil-Futures - invented by John D. Rockefeller. Telephone - invented by Alexander Graham Bell. Power Plant - invented by Thomas Edison. Electric Grill - invented by Thomas Edison. 2-Sided Grill - invented by Michael Boehm. Toaster - invented by Thomas Edison. Light Bulb - invented by Thomas Edison. Electric Searchlight - invented by Thomas Edison. Electric Fan - invented by Thomas Edison. Air-Conditioning - invented by Willis De Havilland Carrier. Electric Refrigerator - invented by Nathaniel B. Wales. Electric Washing Machine - invented by Oliver B Woodrow. Electric Dryer - invented by J. Ross Moore. Blender - invented by Stephen J. Poplowski. Ironing Board - invented by Elijah McCoy. Quick Fryer - invented by Colonel Sanders. Microwave Oven - invented by Percy Spencer. First Practical Electric Train - invented by Thomas Edison. First Practical Dry Cell Battery - invented by Thomas Edison. First Practical Wet Cell Battery - invented by Thomas Edison. Record Players - invented by Thomas Edison. Cinema - invented by Thomas Edison. Steel Reinforced Skyscraper - built by William LeBaron Jenney. Steel Reinforced Poured Concrete Structures - invented by Thomas Edison. Airplane - invented by the Wright Brothers. Moving Assembly Line and Affordable Cars and Trucks - invented by Henry Ford. Diesel Powered Bulk Carrier Ship - the first bulkers with diesel propulsion began to appear in 1911 in the United States. Diesel Train - invented by Thomas Edison. Fax Machine - invented by Richard H. Ranger. Radio Broadcasting - invented by David Sarnoff. Electronic Television - invented by Philo Farnsworth. Television Broadcasting - invented by David Sarnoff. Helicopter - invented by Igor Sikorsky. Nuclear Fission Reactor - invented by Enrico Fermi. Atomic Bomb - invented by Robert Oppenheimer. Hydrogen Bomb - invented by Edward Teller. Transistor - invented by John Bardeen, Walter Brattain, and William Shockley. Industrial Robot - invented by George Devol. Prosthetics - invented by George Devol. Mining Mech Big Muskie - invented by Bucyrus-Erie. Cable TV - invented by John Walson. Satellite Communications - invented by Howard Hughes. Moon Landing - Saturn V and Apollo rockets designed by Wernher Von Braun and the Lunar Lander designed by Tom Kelley. Digital Alarm Clock - invented by D.E Protzmann. GPS - invented by Roger L. Easton. Handheld Calculator - invented by Jack Kilby. CCD Digital Electronic Video Camera - invented by Willard S. Boyle and George E. Smith. Digital Wristwatch - invented by John Bergey. Digital Electronic Still Camera - invented by Steven Sasson. Universal Remote Control - invented by Steve Wozniak. Digital TV - invented by General Instrument. Cellphone - invented by Martin Cooper. Smartphone - invented by Frank J. Canova. Camera Phone - invented by Eric Fossum. CMOS Image Sensor - invented by Eric Fossum. Electromechanical Arcade Game - the first electromechanical arcade game, called Contact, was invented by Harry Williams. Light Gun Arcade Game - the first light gun arcade game, called the Seeburg Ray-O-Lite, was invented in the US. Monitor - invented by IBM. Hard Drive - invented by IBM. Computer Keyboard - invented by Thomas W. Slebodnik and Frank J. Rau. Scanner - invented by Russell Kirsch. Computer Stylus - invented by Tom Dimond. Optical Video Disc - invented by David Paul Gregg. Computer Mouse - invented by Douglas Engelbart. Touch Screen - invented by EA Johnson. Integrated Circuit - invented by Jack Kilby. Video Games - invented by Ralph H. Baer. Internet - invented by Robert Taylor and Lawrence Roberts. Arcade Game - invented by Nolan Bushnell and Ted Dabney. Wireless Internet - invented by Norman Abramson. Microprocessor - invented by Marcian Hoff, Stanley Mazor, and Frederico Faggin. Personal Computers - invented by Bill Gates, Steve Jobs and Michael Dell. PDA - the GridPad, the first touchscreen PDA computer was invented by Jeff Hawkins. E-mail - invented by Jerry Yang and David Filo. Search Engine - invented by Jerry Yang and David Filo. WebTV - invented by Steve Perlman. Social Networking - invented by Andrew Weinreich. Online Video Hosting Service - invented by Chase Norlin. Tablet PC - invented by Bill Gates. Tablet/Laptop Hybrid PC - invented by Bill Gates. Any crypto-Jews on the list? Wade Hampton III wrote: Any crypto-Jews on the list? I am not sure, but the famous Jewish scientist that I know of, Albert Einstein was a plagiarist who copied his ideas from Albert Michelson, Edward Morley, Olinto De Pretto, Hendrik Lorentz, Henri Poincare, and David Hilbert. These 6 scientists published the concepts and equations that would be found in General and Special Relativity before Einstein. The other scientists who laid the foundations for Relativistic and Quantum Physics were John Dalton, William Crookes, Wilhelm Roentgen, Thomas Edison, and Joseph John Thomson. John Dalton for discovering atoms, William Crookes for discovering plasma, radioactivity, and radioactive elements, Wilhelm Roentgen for discovering x-rays, Thomas Edison for discovering thermionic emission, and Joseph John Thompson for discovering the electron. Note that all these scientists are not Jewish. Nature Reserves - pioneered by Theodore Roosevelt to prevent forests from being denuded after scientists found out that trees are necessary to convert carbon dioxide back into oxygen. Tree Farms - a place for the logging industry to cut trees while simultaneously planting new ones to replenish the supply of wood. Firefighting Airplane - airplane that drops water from a tank in its fuselage on forest fires in order to put it out. Controlled Fires - the burning up of accumulated flammable organic matter in forests to prevent larger uncontrolled forest fires from spreading. Once the flame reaches a certain size, a firefighting airplane drops water onto that region of the forest to put the fire out. Fully Reusable Space Plane - invented by Burt Rutan. Mobile Floating Launch and Landing Pad - invented by Elon Musk. VTVL Rocket - invented by Jeff Bezos. Artificial Bacteria - invented by J. Craig Venter. Artificial Virus - invented by Eckard Wimmer. Hypersonic Sound - invented by Elwood Norris. Brain Fingerprinting - invented by Lawrence Farwell. Prosthetic Vision - invented by William Dobelle. Turbine Artificial Heart - invented by Dr. Billy Cohn. According to the Jew-controlled media...American Negroes did many of these things. I hope I can get out in time, but I do see the Mud tide approaching. Wade Hampton III wrote: According to the Jew-controlled media...American Negroes did many of these things. Most of these inventions were produced by people of Anglo-Saxon Caucasian and Germanic Caucasian descent, just like the inventions of the British, French and Germans. 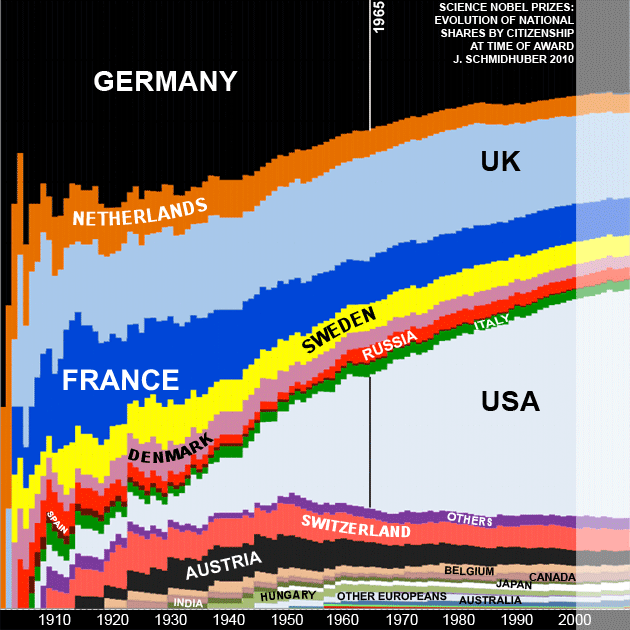 As you can observe in the above graph, the USA, UK, France, and Germany have the widest lines, making them the most innovative. It is also interesting to note that most of the inventions and discoveries in history were made by the Americans and British who are Anglo-Saxon Caucasians and the French and Germans who are Germanic Caucasians. Of course, the Russo Caucasians of Russia and the Sino Mongols of China, Japan, Taiwan, South Korea, Singapore, and Thailand have also produced some inventions but they pale in comparison to the immense number of inventions produced by the Anglo-Saxons and Germans. The other Caucasians such as the Mediterranean, Slavic, and Nordic Caucasians have produced few inventions and discoveries and the same applies to the other Mongols, such as the Central Asian Mongols, and Native American Mongols, the Indians, with their sub-races of Aryan Indians and Dravidian Indians, Arabs, and Africans. The statistics gathered on Nobel prize winners in science and technology and patents just proves the racial superiority of Anglo-Saxons and Germans over all the other races on Earth. An interesting question to ask is why the US had economic recessions in 1929 and 2008 despite the continuous technological progress it has made. Who were responsible for causing these problems? The answer is simple: the Jews, they deliberately crashed the banking system, hedge funds, mutual funds, stock market, and housing markets which are controlled by their financial institutions in order to sell their shares at a high price right before the crash and then buy the shares back when the share prices have deflated after the crash so that they can turn a profit when the market rebounds. This is typical of illogical Jewish subhuman degenerates, instead of working hard, being creative, and making brilliant inventions like USA's famous inventors, they would rather leech off the financial market to make money even if it means crashing the US economy that made them rich in the first place. Ironically, the famous US inventors like Benjamin Franklin, Alexander Graham Bell, Thomas Edison, Nikola Tesla, George Westinghouse, George Washington Carver, Henry Ford, David Sarnoff, Philo Farnsworth, Howard Hughes, George Devol, Steve Jobs, Bill Gates, Jeff Bezos, Elon Musk, and Lowell Wood are richer than these stupid Jews since they are considered the richest billionaires in history. The Jews could also become the richest people in history if they become scientific and technological geniuses and build billion dollar science and technology companies but they are too stupid to do that. It's great to know Whites are so prominent in discovering the secrets of the universe. This topic seems to interest you greatly as you've taken the time and trouble to become knowledgeable. It's just the kind of thing that ought to be on tv.